You’ve waited all year to hit the pumpkin patch. Go ahead and get your gourd on by scooping and blending squash into your October party drinks. When G-rated horchata doesn’t quite cut it, send in the ringers. Namely, pumpkin puree and vanilla rum. Flanked by coconut milk and a touch of coconut sugar, this riff takes Mexico’s traditional rice milk beverage to its seasonal peak. Get the recipe. Roasted butternut squash? This recipe might sound like the beginnings of a Thanksgiving side dish, but fear not. That warm squash gets cocktail ready with a vodka infusion. Use the earthy amber liquid to create a warmly flavored cocktail with fresh citrus juice and generous pinches of cinnamon and nutmeg.Get the recipe. The award for most seasonal presentation goes to this delicata squash–ensconced tiki twist. It’s an ambitious endeavor, but won’t your guests be bowled over by a delicata squash filled with an autumnal elixir of chai-infused rum, toasted pepita orgeat and pumpkin butter? Obviously. Get the recipe. Don’t knock this pumpkin-packed Old Fashioned until you try it. Rye whiskey, maple syrup and a spicy, ginger snap-inspired liqueur are blended with pumpkin puree for a cocktail that drinks like a slice of pumpkin pie. Get the recipe. Cue pumpkin lovers’ squeals of delight. Once the dry ice starts smoking, your guests will know they’ve come to the right party. 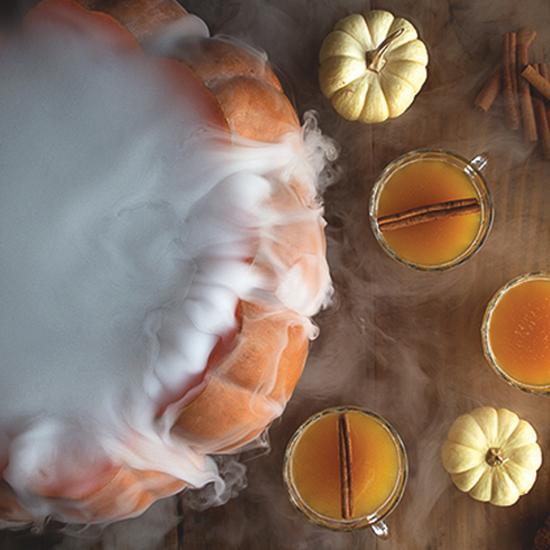 The presentation is great, but the best part is the festive punch inside, which deals a double blow of fall flavor from spiced rum and spiced simple syrup, along with silky pumpkin puree, citrus juices and sparkling water. Get the recipe.